have to find my warmth by other means. Finding a patch of sun and curling up in it like a cat is one option I enjoy. I’m not very good at starting a fire and even worse at remembering to feed it. burns as cleanly as possible. 1. To get a clean burn be sure to use freshly cut or “green” wood. 2. Store wood outdoors, stacked neatly off the ground with the top covered. 3. Start fires with clean newspaper and dry kindling. 4. To keep your fire cool and the smoke to a minimum, let wood smolder. creating a mound. Do not spread the coals flat. 6. When reloading your stove, add one log at a time. 7. Always burn the biggest fire your stove can handle. end grain, and sounds hollow when smacked against another piece of wood. 4. False: Burn hot, bright fires. time, on and behind the mound of hot coals. Avoid adding one log at a time. 7. False: Use smaller fires in milder weather. 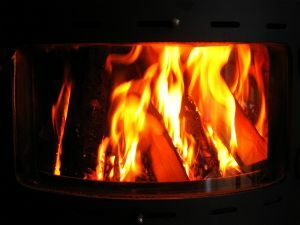 recommendations for cleaner wood burning at woodstoves. hanging outside—not to mention your lungs.